YCN have just announced that their up-coming Student Awards programme will be launching online on Monday 1st November at http://awards.ycnonline.com/briefs. Designing book covers is still probably the dream job for many graphic designers, and it's something we look at in detail on the HND course. So it's great to see that Edinburgh's Talbot Rice Gallery is curating 'Gray Stuff - Designs for Books and Posters, 1952 – 2010' - an exhibition of Alasdair Gray's rather amazing visual works. Gray is a former student at Glasgow School of Art. But despite his artistic talents, he found fame as a novelist, and at 75, is considered Scotland's greatest living writer. This exhibition showcases his unique illustrative and typographical style, which has appeared both on the covers of, and inside, his many acclaimed novels, such as Lanark (1981), 1982 Janine (1984) and Poor Things (1992). He has also designed book jackets and magazine covers for dozens of other writers and publications, and has painted a number of murals inside some major buildings in Glasgow. Alasdair Gary seems to be finally getting the recognition he deserves for his visual art - his work is currently also on show at the Modern Art Gallery, and at the British Art Show (currently on tour in Nottingham). BBC2's Culture Show is featuring a special on Gray tonight at 7pm, and he has just published 'A Life in Pictures' - an autopictography featuring 50 years' worth of designs, sketches and illustrations. Before the end of this semester we'll hopefully arrange a visit to Gray Stuff for some of the Graphics classes. HND Year 1 have just finished a nice print project. This was set by David W and required the class to produce two covers and a doublepage spread for a world music magazine. Check out some of the great pieces this project produced in the Galleries section. Sample boards for CABE, HND II. HND II presented their CABE projects earlier this week. 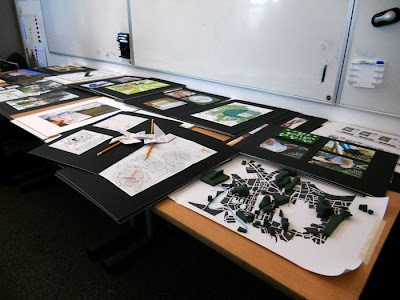 Mentors Graham Neish (Neish Design), Graeme Lewis (Nevis Agency) and Alan Lennon (Lennon Design) were in attendance and the class also participated in some interesting peer critique. This was the first chance to test our new presenting easels, which David W purchased at the start of the semester. These allow a student to display up to four boards at any one time. In combination with digital content on the interactive whiteboard, this new setup looks like it will really broaden out pitches and solution deliveries. CABE samples have been posted in the Gallery.